The rock architecture at Aihole can mesmerise the pious as well as archeological buffs. The town has numerous temples built by the Chalukyas. In fact, the temples of Aihole are often regarded as symbols that stand testimony to the evolving styles of the Chalukya kings in their attempt to bring about a definitive Chalukyan architectural heritage. 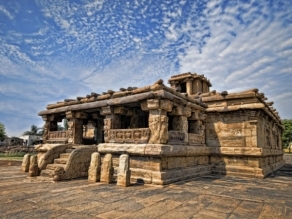 There are around 125 Chalukya temples in Aihole and the Lad Khan Temple is the oldest one dating back to the 5th century. The other famous temples include the Gowda Temple, Suryanarayana Temple and the Durga Temple. The Ravana Phadi Cave is one of the oldest rock-cut cave temples. Aihole is also famous for an inscription which recounts the history of the period. 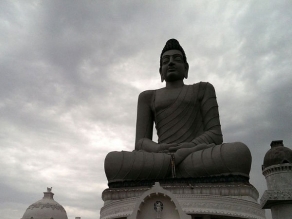 The place lies 483 kilometres from Bangalore and has good road connections. The nearest railway station is at Badami. There are numerous buses plying to Aihole from places, such as Badami, Pattadakal and Bangalore. Air conditioned as well as non air conditioned buses are available from these places. Bagalkot railway station is the nearest railway station to Aihole located at a distance of about 34 km. This railway station is well connected to major cities in India and the nearby areas. Belgaum Airport is the nearest domestic airport to Aihole, situated at a distance of about 162 km and Bangalore International Airport is the nearest international airport (514 km). Bangalore airport is well connected to major European, Asian, American and Middle East countries along with all the major cities of India. 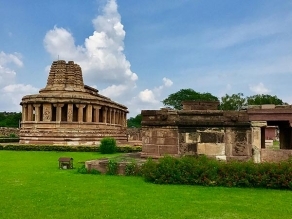 Did You Know that Lad Khan Temple in Aihole is a Hindu Temple?